Sports on TV • Channel also is still striving to expand its reach on more cable systems. 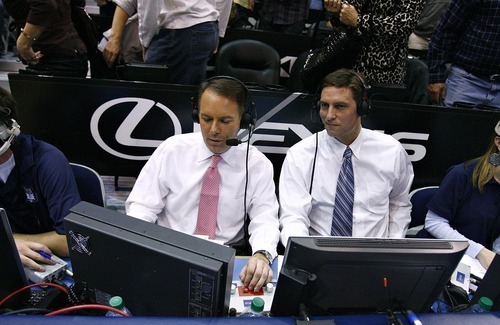 Djamila Grossman | The Salt Lake Tribune Brigham Young University broadcasters Andy Toolson and Dave McCann, left, work during a BYU basketball game against the University of Arizona in Salt Lake City, on Saturday, Dec. 11, 2010. Representatives of BYUtv are in Boston this week, selling their channel to as many cable systems as they can. Well, not exactly selling. They're at The Cable Show trying to persuade as many cable operators as possible to add their free channel. Which is great for Cougar fans. The TV industry event features speakers ranging from Conan O'Brien to NBA commissioner David Stern, panels and exhibits. And BYUtv is right there with AMC, CBS Sports Network, Discovery, ESPN, Lifetime, NBC Universal and more than 200 other exhibitors. The BYUtv booth is bigger than HBO's, Showtime's, Starz's and a lot of other big names. All in hopes of adding a few million more cable subscribers. The numbers are in constant flux, but BYUtv's distribution is closing in on 65 million U.S. homes. No, that's not quite ESPN or ESPN2 (about 99 million homes each) or the NBC Sports Network (80 million). But it's more than CBS Sports Network (about 45 million homes), the NFL Network (59 million) and NBA TV (59 million), and not far short of the MLB network (68 million). The Longhorn Network is still struggling to negotiate any kind of significant distribution deal as it prepares to enter its second year of operation. But Texas and its partner, ESPN, are trying to make money from LHN; BYUtv is just trying to get the channel  and the word out there. Let's be clear. Nobody expects people in 65 million homes will watch the BYU-Weber State game on Sept. 8. But people in 65 million homes can watch the game. Given that access to BYUtv's live online streaming is ubiquitous, Cougar and Wildcat fans pretty much anywhere can watch the game. There are a lot of fans at a lot of schools who would kill for that kind of easy access to just football and basketball. And BYUtv also covers everything from baseball to softball to soccer to volleyball. You can criticize BYU for its decision to go independent. You can point out (as I have) that exposure doesn't necessarily equal relevance. You have to acknowledge, however, that BYU and BYUtv have delivered on their promise to make games widely available to Cougar fans. And that they're putting a quality product on the air. BYU lovers may tell you the channel is great; BYU haters may tell you it's terrible. It's interesting to note that BYU foes who aren't heated rivals will tell you they're impressed. After the BYU-Idaho State football game last fall, Bengal fans used words like "enjoyable" and "phenomenal" on bigskyboard.com to describe the telecast. Farther from home, Baylor fans fell all over themselves to praise BYUtv after the Bears-Cougars basketball game in December. Comments on BaylorFans.com included: "First class announcers and crystal sharp image. Very impressed." "Great broadcast." "Class act for broadcast." "Best 1080p stream I've ever projected from my laptop onto my best TV  just fantastic!" The only really dumb comment came from a self-described BYU fan who incorrectly told Baylor fans "BYUtv Sports is mostly done by students," which is flat-out wrong. There are a few interns, but BYUtv is staffed by professionals. And they did a great job in Year 1 of football independence and West Coast Conference membership in most other sports. Scott D. Pierce covers television for The Salt Lake Tribune. Email him at spierce@sltrib.com; follow him on Twitter @ScottDPierce; read his blog at sltrib.com/blogs/tv.